Lao Tzu Chess was invented shortly after Sun Tzu Chess, as an improvement to the fog of war. It is now possible to obfuscate your position and pieces much longer because you can only drop pieces to the part of the board you can move to. This variant is a great improvement over Sun Tzu because of it's tactical skill requirements. It's important not only to hide your king, but to set up proper lanes of attack with your ranged pieces. The Knight is even more a threat to the Queen and the King than in other game... but is also weakened by it's limited visibility. The standard pieces are used. 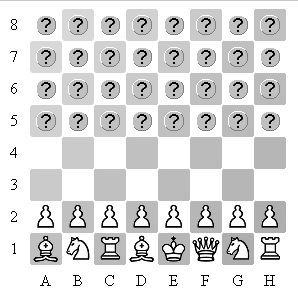 Normal chess rules apply with the following differences: You may only see the spaces on the board where your pieces could move. Example board after several moves: Captured pieces change sides and are held in hand by the capturing player, who may later drop the piece back on the board as his own. (See Crazy House) Except for Pawns, pieces held in hand may be dropped on any empty square that can be moved to by your pieces. Pawns may be dropped on any empty square that can be moved to by your pieces which are not part of the first or last rank. When a promoted piece is captured, it changes back into a Pawn before it is put in hand. It is legal to checkmate a King with a Pawn drop. Special visibility rule impact not only player knowledge, but also the game tactics. Quite often it turns out, that some attack can not be developed, because the square one would like to drop something is not visible. In particular, you are not able to drop sequence of pawns (attack typical for Crazy House and Sun Tzu). You dropped pawn on e6? Nice, but neither f7, nor d7, are visible, so you can not drop anything there. 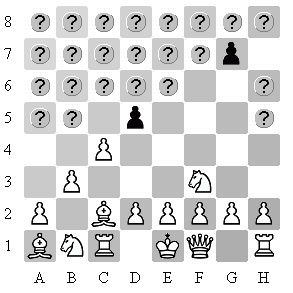 Similarly, sacrificing pawn or piece to disorganize opponent position, rarely works - as the created or discovered weak squares are covered by the fog of war immediately after the pawn or piece is captured.